DIY Pinwheel Decorations for a baby shower or any party! 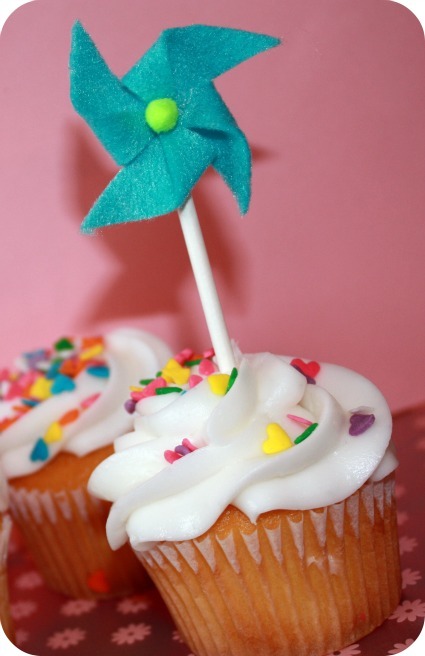 Pinwheels are such a simple and cute way to add a splash of color to your baby shower! Up until now, I always thought they were hard to make, so I kind of shied away from them. It looked like they required crazy origami folding skills! But it turns out that I was wrong! They are so simple ~ anyone could make them! 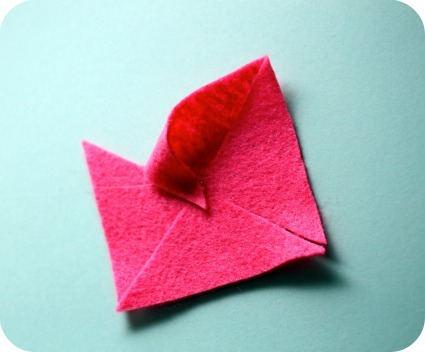 Be sure to scroll all the way down the page for a FREE pinwheel template. These cuties were made using colorful felt but you can also choose to make them with scrapbook paper (There are so many adorable patterns and themes of scrapbook paper.) You can also make your pinwheels in any size you want. These are mini ones, perfect for cupcake picks - but you could make larger ones and give away as favors, attach to gifts, poke into flower pots, etc. 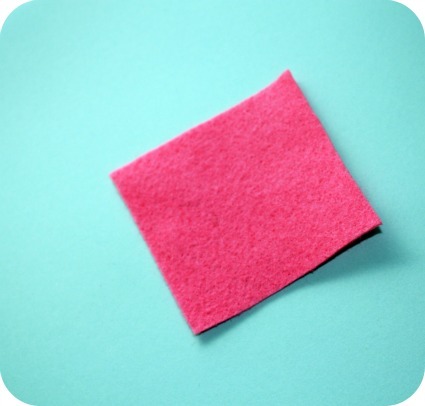 Begin by cutting your felt or paper into squares. These are approximately 2" squares. Don't worry about being precise and cutting perfect lines, I just eyeballed it and didn't use a ruler - and they turned out fine. Cut from the corners of the square and stop just short of the middle. Making 4 connected triangles. Be careful not to cut too far in. 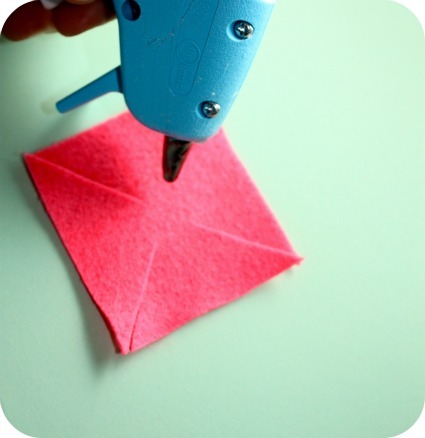 Using a glue gun, add a dab of glue to the center of your square. 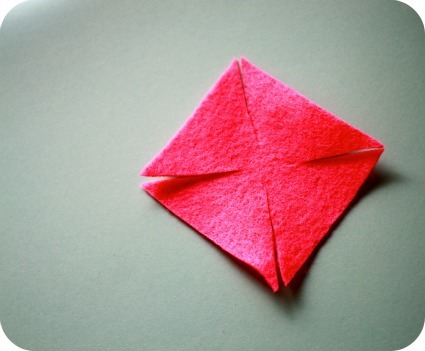 Fold in the left side of each triangle. Add dabs of glue as needed. Don't worry if you can see the glue. It will be covered up in the end. This is what it will look like when all 4 left corners have been folded in. 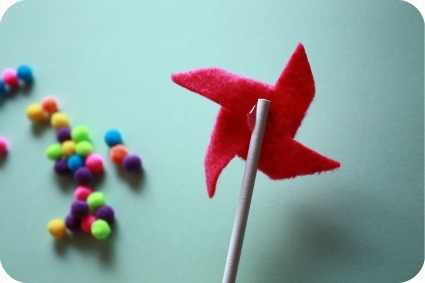 Here are some simple ways to jazz up your pinwheel decorations! 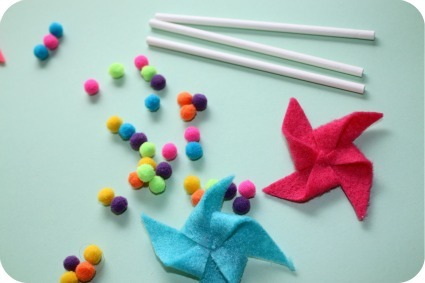 You can also attach them to wooden skewers, use sequins in the center... use your imagination and have fun! 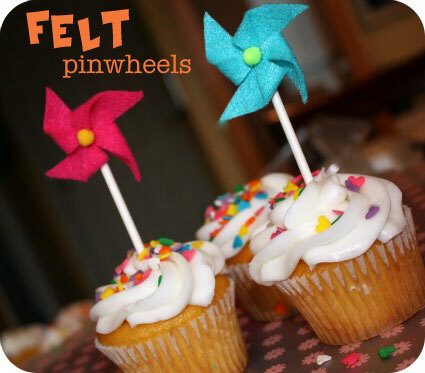 There are so many fun ways to use these cute pinwheel decorations! Poke into cupcakes, food dishes, tie onto packages! You don't have to add the stick if you don't want to ~ you could glue the pinwheels onto nametags, invitations, place cards, glue onto a strip of ribbon and make napkin rings! Note: These are non-spinning pin wheels. 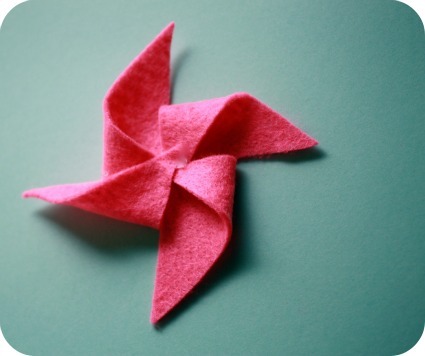 Felt doesn't spin too well ~ but, if you want your pinwheels to spin, use scrapbook paper, omit the glue gun, and instead, insert a pin into the center to hold the folded ends together. Then you can poke the pin into a straw or the eraser end of a pencil. I designed 3 different sizes for you to use.